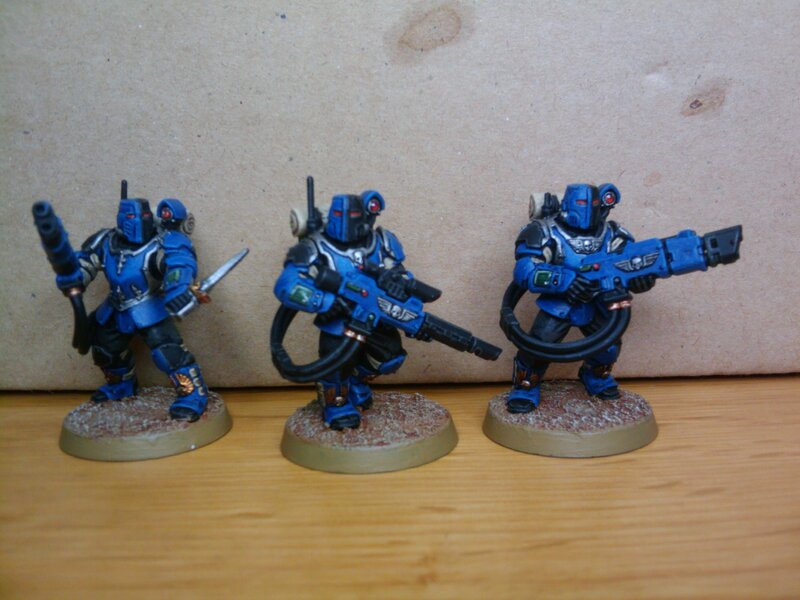 So, first up, here are some pics of my latest scions. 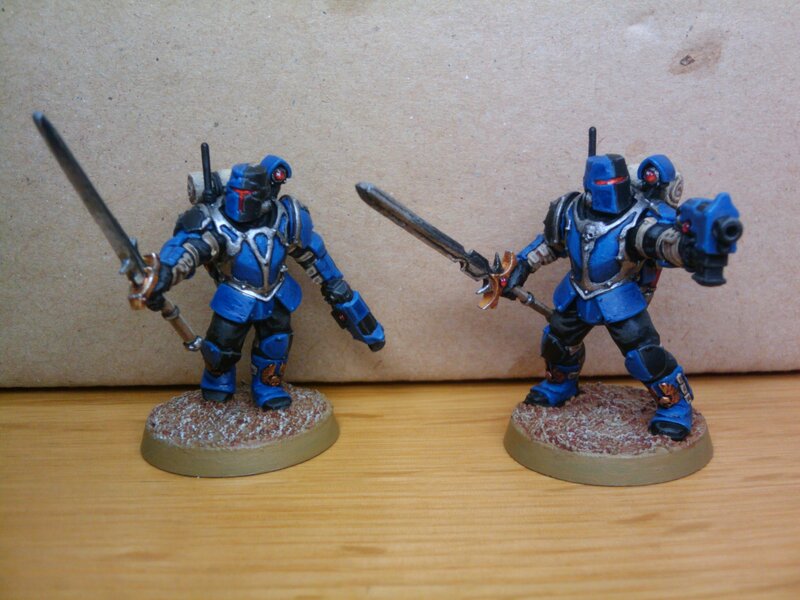 It feels like these guys have been on the paint station for ages, so it is very nice to (finally) get them completed. I’ve added 2 volley guns and 2 tempestors/sergeants, as well as an additional hotshot lasgunner, so now I can run 2 legit squads. Secondly, I’ve been working on a one-day campaign to play with my Daemonic buddy Ross next weekend. It’s the first time I have attempted to do this, and I’m really excited about it! Essentially, it is going to be 1000pts of Praetorians defending a village against wave after wave of Daemons. It is loosely based on the ‘Last Stand at Glazers Creek’ battle report from White Dwarf 222, back in 1998 (showing my age now!). You can find this venerable report via google – it is well worth a look, if only to see Jervis Johnson’s hair, and Adrian Wood’s amazing orks! Heck, it’s all good, so if you haven’t seen it then go find it and enjoy a piece of hobby history. Of course, any scenario like this needs a few things – narrative, terrain and rules. I’ve had great fun putting the narrative together and drafting some rules, and I hope to be reviewing these with Ross soon. The rules are designed to put both sides in an awkward spot, in line with the narrative – the defender will be ground down and weakened over successive and increasingly desperate games, while the daemonic attackers will find that the planet itself is fighting against them… crucially, the scenario is designed to be the start of an open ended narrative, and will hopefully be the start of a sweeping tale. I’ll share my efforts here, once all is agreed and finalised. Now… terrain… my ‘bete noir’. 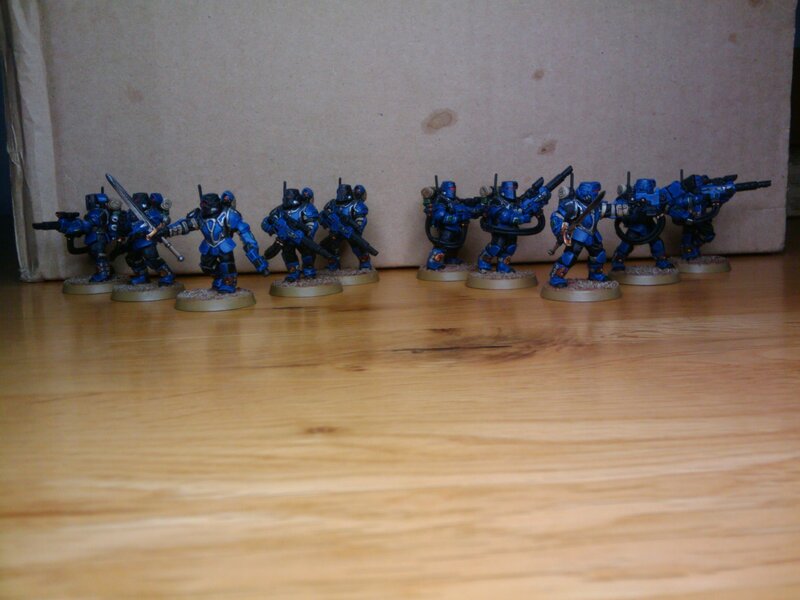 I confess, I don’t really enjoy making or painting terrain, and I don’t own much as a result. Most of my gaming is done at the local club, and they are well furnished in the terrain department so this hasn’t really been a problem for me thus far. I do have a few home-made industrial looking bits for the odd hit-out with my eldest boy, but nothing of note. The GW gothic vibe doesn’t really do it for me either, so although their scenery looks good, I haven’t been tempted in that direction, (What? Another ruined city you say? Damn, this looks just like that last ruined city! Wow, another wall of martyrs? What are the chances of that! Hey, that statue looks familiar, have we been here before?!?). Blah blah blah… How come no-one else gets any scenery anyhow? Doesn’t anyone ever fight on a non-imperial world? I think that my terrain apathy is all symptomatic of my hobby preferences to be honest – I get most of my enjoyment through collecting and converting toy soldiers, painting them and inventing fluff… The gaming actually comes at the bottom of the list for me, and I think that my reluctance to get involved with terrain is a symptom of that. But… (and this is why I love this hobby so much)… My love of Praetorians stemmed from the Glazer’s Creek report all those years ago, and that is why I started collecting the chaps in red when I got back into the hobby. This in turn has introduced me to a most excellent chap who shares my veneration of ‘oldhammer’. We became friends, and that friendship has encouraged me to come up with a (hopefully) cool scenario for us to play… this needs some terrain to play it on. Thus the circular nature of the universe is revealed to me, and I find myself needing to pull my finger out regarding getting some scenery sorted out pronto! Has anyone else found themselves in the same situation? I can’t be the only one, can I? Anyhow, panic ensued, but Yey! Good news! I had a look around t’interweb and found a pre-painted ‘middle eastern’ settlement that has the exact vibe that I want – it’s pricy, but I’m short on time and motivation to do my own, so what the heck. Hakuna matata and all that. I’ll put up the details when I take delivery of the settlement – but it looks totally amazing in the pictures, and not a single aquila or dumb-assed statue in sight! I have high hopes that it will make the game something special. I think that’ll do for now, more to follow later in the week. Exciting times!